Money changes hands a lot. In fact, the circulation of a single dollar bill could span the entire globe. This has become a fascination in recent years as the global way of life has taken hold and more people are curious about where money travels. To get in on the fun, Where's George rubber stamps are the perfect solution to let others play along! 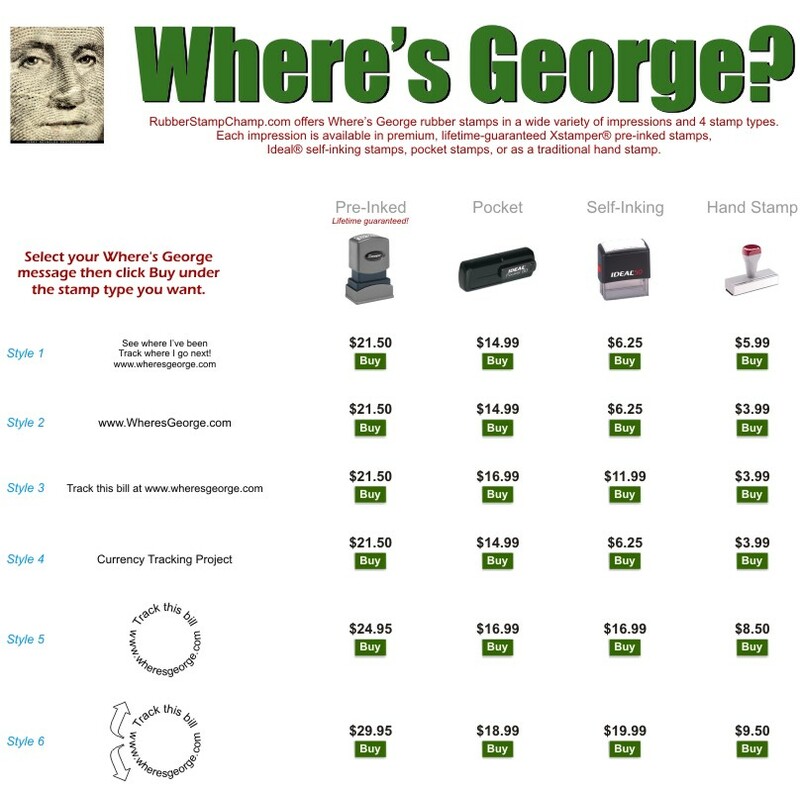 We offer a wide selection of Where's George stamps to fit any preference, need, or budget with ease and affordability. Choose from the best brands in the business such as Ideal, Xstamper, and more for a quality product you can trust. These Where's George rubber stamps are made with the highest standards of quality and long-lasting performance. In fact, many of these stamps are offered with a lifetime guarantee for added peace of mind. Choose from your choice of hand stamp, pre-inked, or self-inking, as well as a range of sizes. We offer larger desk stamps and even pocket-sized models for stamping on the go. The impressions of these Where's George stamps are always crisp and clean for easy readability making them perfect for this type of endeavor. We offer several different inscription choices such as See Where I’ve Been, Track This Bill At, and more. All of the options feature the website curious minds can go to in order to track the bill and see where it was before it made its way to their hands. When you need an affordable and long-lasting stamp to keep track of George, look no further than our expansive collection featuring the best of the best. At Rubber Stamp Champ, we are pleased to be your source for all your stamping needs for a variety of purposes and occasions. We have spent the last twenty years creating high-quality custom rubber stamps using our precise laser engraving technology. If you have any questions or would like us to create something special for you, please contact us for more assistance of any kind.